The algorithm of this Expert Advisor calculates the end of the second and fifth Elliott waves and opens a deal in the direction of the third wave. At the end of the impulse movement, the EA moves the order to the breakeven level and activates trailing stop. After opening an order, the EA sets the take profit and stop loss levels by modification of the order. It is recommended to use the EA on trading terminals with 5-digit quotes. 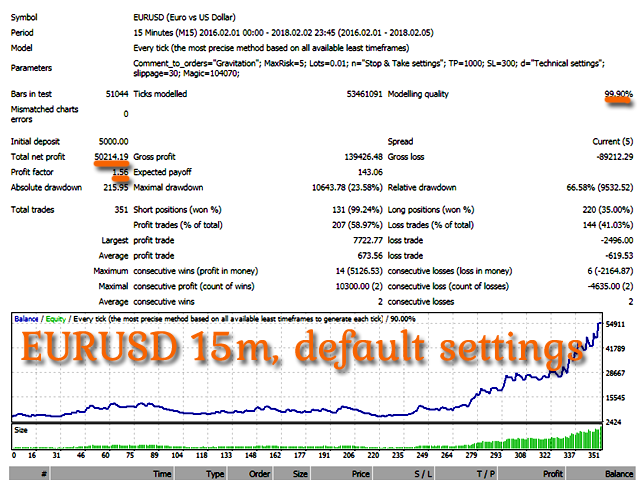 The Max Spread parameter prevents opening orders when broker increases spread. 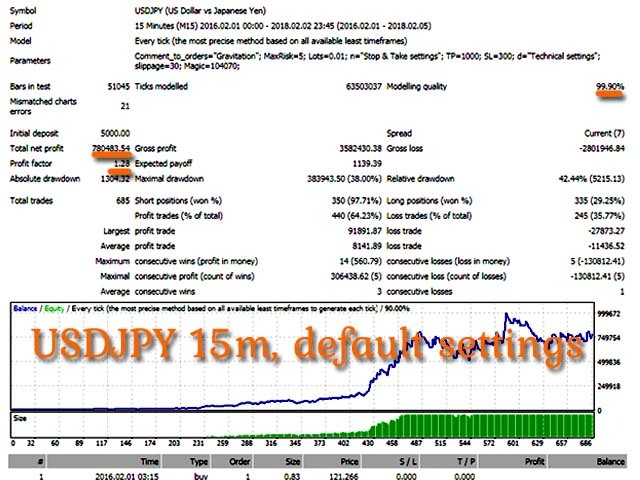 Recommended trading symbols: EURUSD M15, EURCHFM15, USDJPY M15. Comment to order - comment to the opened orders. if MaxRisk = 0, Lot will be - lot size if MaxRisk=0. Trailing-stop on/off - enable trailing stop. 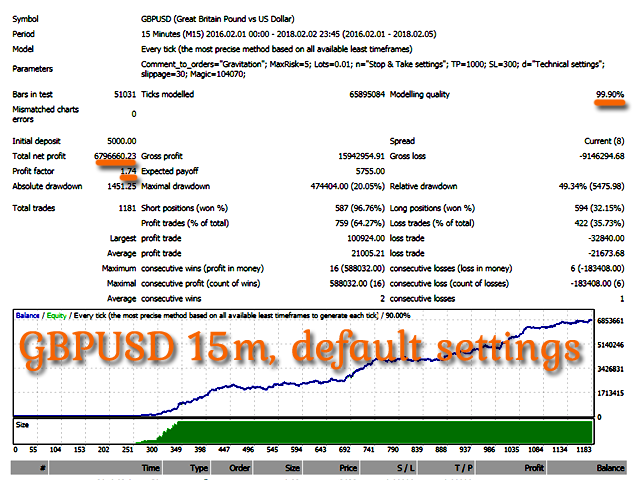 Start trailing - the number of points to activate trailing stop. First trailing level - the first stop loss level of trailing stop. Trailing step - step of trailing stop. Max Spread - maximum spread. Slippage - allowable slippage value. Magic Number - magic number to identify the EA's orders. EA looks good and well balanced and promising,has good backtesting results! Possible personal modifications for a better optimization. I'll come back after 3 months for full review. Update: Yep,only testing results looked great. On real acc. a lot of losses and small wins. Account dropped... Do not buy! Not worth it! I bought this EA because of the great testing results. Big mistake! The EA works only in strategy tester. It places trades mainly during the news events and big movements. Because of volatility EA losses trade after trade. Trailing stop works only on buy trades but not on sell trades. Often happens that the trade is open and because of volatility the EA could not place SL and TP and there goes your account. Too much money for this poor EA. Improved the trading logic. Modified trailing stop. Improved the mechanism for managing open orders.